This couch came quickly and as described. Very easy assembly and everything was packaged perfectly. I love this couch and it was exactly what I was looking for. It is small but that’s why I purchased it. I needed it to fit in a small space. It still comfortably fits 3-4 people. Classic lines and contemporary design make the Dorel Living Kaci Sectional a timeless piece for living rooms and seating areas. This small spaces sectional is the perfect blend of form and function with spacious ergonomic seating and generous padding. The sinuous spring foundation and pocket coil seat cushion combine to offer ideal comfort with no compromise to style. 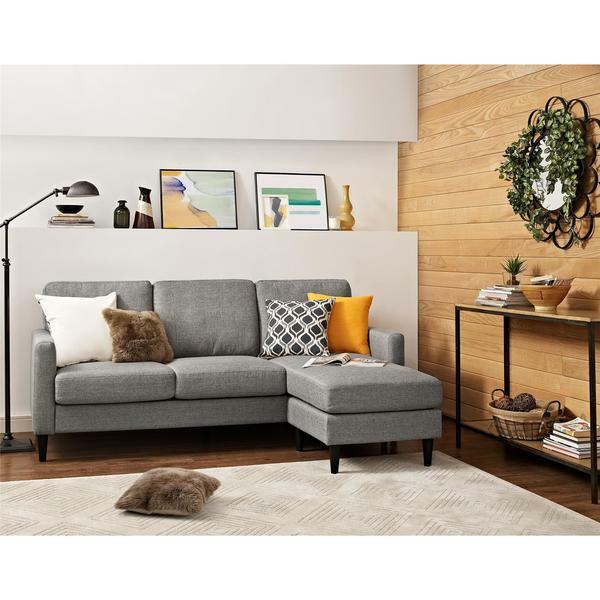 Upholstered in a soft grey linen-look fabric that is easy to maintain, this sectional achieves a clean and simple silhouette and will work very well with any home decor. The interchangeable chaise can be arranged on either side allowing you to easily customize depending on the configuration of your room. Part of the Kaci collection, the Dorel Living Kaci Sectional will bring ample seating and modern fashion to your home. 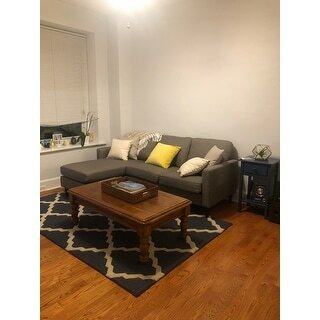 I was searching for a sectional that would fit well in my new apartment and this piece is just perfect! Great for small living spaces but not too small for having company! And it's super comfy to snuggle up and watch a movie! Plus the color is a great tone of grey! Love my new couch! This sectional was ordered for a condo unit and was recommended for a smaller apt./condo space. Very easy to assemble and has a modern clean look. 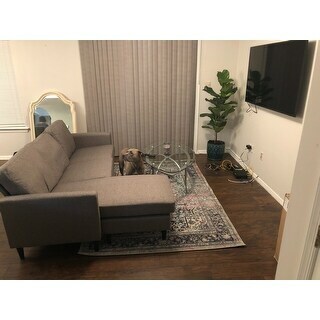 This is a small sectional which is perfect for my space. What I like the most about this sectional is that it is the perfect size if you have a small apartment and still want to incorporate a sectional couch. I was a bit worried as I prefer to buy items that I can see in person but the reviews helped to make the best decision ever!!!! We got the couch back in December 2017 and it is holding up pretty well. I would definitely recommend this to a friend or family member! I absolutely love this couch! 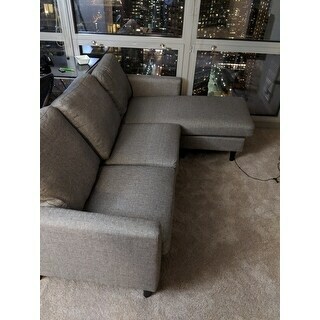 I was amazed at how easy this sofa was to put together. While unpacking it, I kept looking for the big box of endless screws and other hardware. I never found it, because all the brackets were already screwed in place. All you had to do is slide the pieces together and stick the cushions on. I did this sofa myself because I was home alone when it was delivered and I couldn't wait. It took me maybe 20 minutes. Yeah, it was very heavy, but it's not impossible to do it alone. The fabric isn't very soft, but it's really pretty and doesn't immediately scream "cheap industrial grade couch." Admittedly, this sofa is not very comfy. The bottom cushions are VERY firm, but the back cushions (attached by velcro) are much softer. You won't sink in to this sofa and cuddle up, but I figured that would be the case for this price. I wanted something that would look nice but this sofa won't see heavy use. This piece is perfect for what I need. I'm still trying to figure out this sofa. The cushions come vacuum packed and a few of them still haven't expanded to fit into the fabric. It is very very firm. The size is just right for our small living room but I'm not sure it will hold up to everyday use for a long period of time. I guess you get what you pay for. Sofa for my Game room. I wanted very casual seating arrangement where I can seat with my dog without worrying. Essembely was very easy. It took my husband and I to essembeled in 45 minutes. Suits the color of my room. I wish that the cloth on back was more fitted. But I still enjoy this sofa. Very cute, very easy to assemble. I am very pleased with the actual size of the sofa. It fits very well in my living room. This is the perfect couch for my small living room. Very comfortable to sit. Only issue is the seat cushions slid forward. Had to place velcro to secure them. Overall, Love It. We love this gray modern sofa sectional. It is perfect in out extra family room area where the sun shines on it perfectly. Sharp looking and comfortable to sit on when I read. One of our daughters will enjoy it in their college apartment in a few years. WARNING!! DO NOT BUY!!! GARBAGE! TRASH! RUBBISH! IM SELLING THIS AT A LOSS. Received the item and built it in about 20 minutes. It resembled the couch in the picture but THIS IS NOT MEANT FOR ANY HUMAN. I'm a 225lb man and sitting on the unit results in the springs SINKING TO THE FLOOR. Any support you have is quickly lost as the person sitting on it slowly sinks as the cushion slips out from under them. The arms have NO CUSHIONING, they hurt your elbows when you put your arms on them. The back of the couch forces you to lean back causing back pain from simply sitting it normally. To top it off, if it turns out you want to return it you will be quoted with $ in shipping fees because the thing is HEAVY. For having so little support the thing is ridiculously heavy. Please, please do not buy this. Go to ..., go to bob's discount furniture, but stay away from this heaping mount of moist grey lard cushions supported by what can only be described as my 3rd graders macaroni art soaked on the streets for weeks in the foulest, mosquito infested, stagnate rainwater. Attractive and comfortable for the price. One downside is there can be a velcro-y sound when adjusting your position, due to how the back cushions are attached. Overall, satisfied with my purchase. 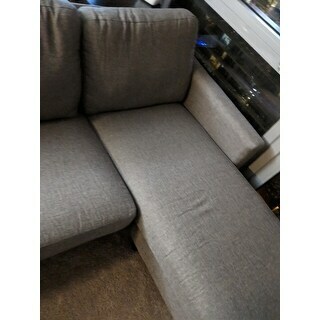 I bought this couch solely off of other peoples reviews! It was delivered in pieces in one large box. Simple to put together, I didn’t need to look at the instructions. Took my dad and I about 30 minutes. This couch fits perfectly in its space! Perfect for condos and apartments. The only annoying,but fixable, thing is the cushions slide off when you sit down. I hope buying a strip of Velcro can fix that. The back cushions come with Velcro already, too bad the manufacture didn’t do the same thing with the seat cushions. Overall a comfortable couch!! And I am a happy customer. So easy to assemble! Didn't need any tools! And it didn't come with any tools! It's also the perfect size for my studio but also not too small. It’s perfect. My daughter and two friends assembled it themselves.❤️ They are quite pleased with their living room. I assembled this by myself in less than 20 minutes - it would be even faster with two people. It doesn't get any better than that! The pillows do need time to re expand and air out - so I left the windows open for a bit so the living room didn't smell chemically. Comfy sofa with a good amount of support which I was looking for. I wasn't looking for anything that I would sink into especially with my back pain issues. Love quality and color is the same as pictured. I love this sectional. Perfect for a small apartment. The color is great. It was very easy to put together. I did it myself and I am a petite 4 11". It was delivered by Fedex and left at my door. Getting it inside was a bit tricky but other than that I am very happy with my purchase. "Is the chaise created by a lose foot stool base or is it secured to the actual couch?" "Does the chaise portion have storage?" No, there is no storage in chaise portion. "It looks like the sofa arrives in one box. What are the dimensions of the box?" "Has the firmness of the couch eased with time?" "is this right arm or left arm? or customizable?" "are the back cushions attached or removable?"